Is it a Tea Cosy or is it a Hat? A friend, actually it is a friends sister, works with children and her trademark is hats, she tells me she has a whole range of them from funky to funny. It all started a few Christmases ago when she wore a santa hat for work, it caused such amusement that she has been collecting hats ever since. 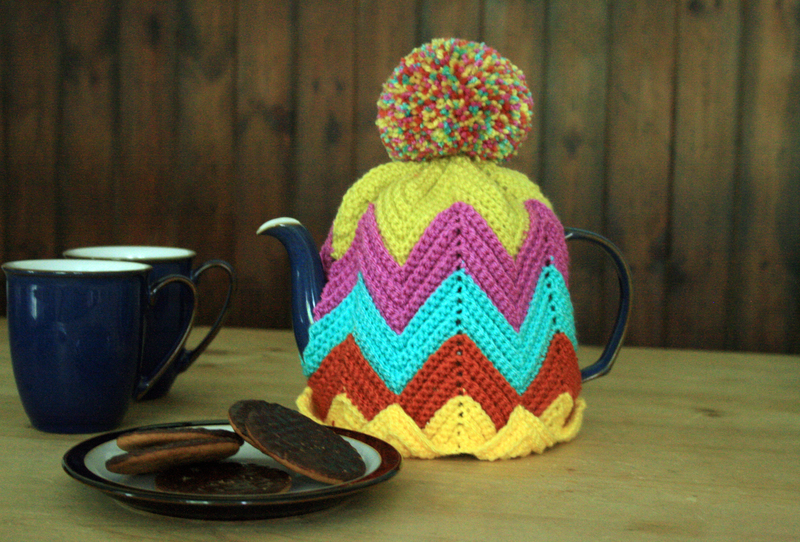 It started with this colourful stripy Ripple Tea Cosy. Anyway this lovely (slightly crazy lady) saw this Tea Cosy and asked me if I could make her a hat in the same style. Well it does look rather like a hat doesn’t it? That’s what I thought, that is until I sat down to make it! The Tea Cosy is made in two halves but I thought the hat would look better with just one join, sounds simple enough, just add the number of stitches and off you go. But when I tried to put the cosy on as a hat it was a little on the tight side so the hat would need to be bigger. That’s when it took a bit more thinking about, to get the right size and the pattern to join in a continual zig zag. I do find it quite taxing to work these things out, it all makes sense on paper but then in practice………not always so. I have been trying to find some software for crochet pattern writing but sadly have yet to find anything that works well. If anyone knows of anything I would love to hear from you. In the meantime I will be delivering the hat this weekend, I hope she likes it. So happy you found something to lift your mood and make you smile. I hope you will share your completed hat, I look forward to seeing how it turn out. Your comment made me so happy, at least I know for sure there is someone out there who would wear my creation, thank you. 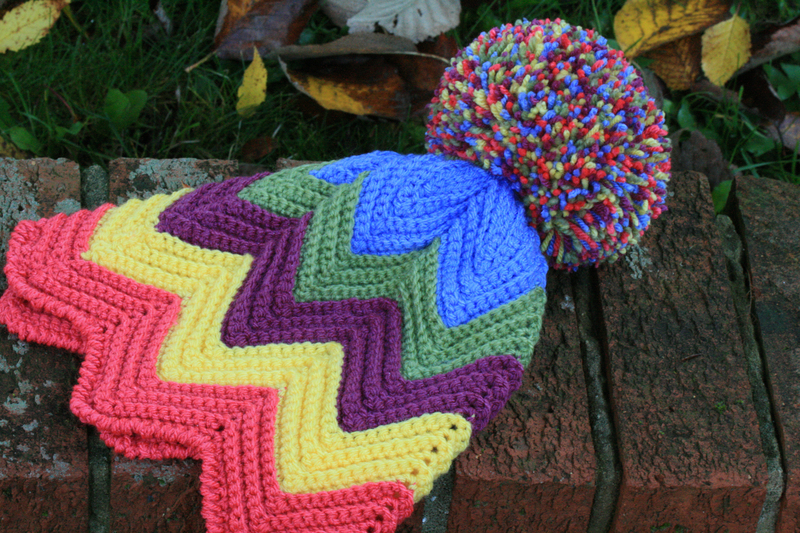 The hat is gorgeous as it is the teapot cozy! Oh, I know that well since I have it at mine ❤ Thank you so so so so so so so very much for your precious gift!!! My pleasure, thank you for your support my friend. To be honest it drives me crazy too, I try and work it out logically but so often it doesn’t work, well not at the first time. Patience is most certainly required. She’ll not go unnoticed, wearing that! Lovely neat work. Too true, she is a real fun character. It would be so much fun to set up a hidden camera in a room full of men and tea cosies and see what happens. She is gonna love it. It is such a unique hat. My favorite things to crochet are beanies and hats. You can just do so many things with them. You are so right, I have made the occaisonal crochet hat previously but am hooked at the moment. I have made knitted animal hats though and they too were addictive. I found that post for Age UK. What a neat idea and such cute little hats. You have remined me that it is that time again, I may make some more tiny Innocent Smoothie bottle hats, it is such a good charity to support. I think it’s great 😊! Thank you, I hope she does too. She is crazy but with a big heart. She was right though it does work, well maybe not for everyone but my friend is certainly one of a kind. Gosh! software for pattern writing that sounds novel. Design will make a very jolly hat. I have found a couple of items but neither work particularly well, I will keep looking and hopfully will find something one day.